Threat Emulation engine update (or any Threat Emulation updateable component) download fails with "Threat Emulation update failed, cannot download <Name_of_Component>. Failed running download process." log in SmartLog / SmartView Tracker. "Error: Threat Emulation update failed, cannot download JAVA. Failed running download process." 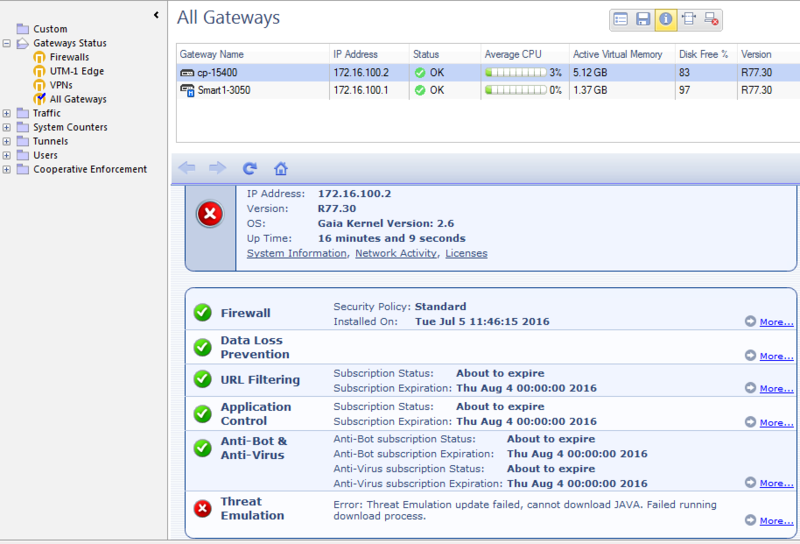 status appears for Threat Emulation blade in SmartView Monitor. [NOTICE] http_client_destroy: Free HttpClient memory - Done. Check Point Update Center updates.checkpoint.com has moved to SHA-256 based certificates (refer to sk103839). However, the version of Threat Emulation engine that is used does not support SHA-256 based certificates. sk95235: Threat Emulation Engine Update - What's New?